Twenty men hang off the sides of the train’s engine, more sitting on the roof, arms and faces hanging from the windows – this is the third-class train from Cairo to Alexandria. In comparison, my first-class seat has air-conditioning and the windows are closed against the warm late afternoon air. Our train is watched by a man and his young son, standing in the vivid green fields, and two men bringing in their fishing nets as we cross the Nile. The train is spotted with agonizingly young naval offices, scalps still smarting from the brutally short clippings that show up childhood scars, whorls and crowns, who squeeze past the tea trolley in their spotless newly issued uniforms. Alex’s history is written in its seafront hotels’ and cafés’ names – Omar El Khayamma, Romance, Cafe de la Paix, New Savoy, Cleopatra, Windsor Palace, Portofino, the Cecil… For sensational coffee – surely some of the best in the country – reader I urge you to visit the Brazilian café near Midan Saad Zagloul on the corniche. It could even show Melbourne how it’s done (cue to sharp intake of breath!). Also ticked off the list was Pompey’s Pillar, a 25m high pillar of red Aswan granite once part of a larger temple complex built in the 400s and is one of the few remaining true antiquities from Alex. Embarrassingly, the last time I was in Alexandria, I managed to avoid the Alexandria Library, the modern replacement to the most famous library in antiquity. 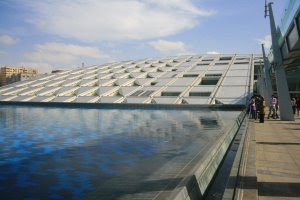 Today’s library is a round disk representing the sun – symbolizing “the flow of information from Egypt to the rest of the world,” said my guide. Sometimes you need these reminders for how influential this country has been on subsequent civilizations. We’d hired a minibus to take us back from St Katherine’s monastery to Cairo, a trip of about five hours which, on the public bus, takes between seven and eight. To make ends meet, the driver had filled the bus up with other passengers, who couldn’t work out what he was pointing at. Fair call. We’d driven off the highway, down a dusty track lined with lorries to a dead end. He pulled up, told me to photograph the Suez canal through the windscreen and was already backing up as I pulled my camera out. Folks, it was a distinctly unattractive view of one of the world’s great engineering feats. Just a bright strip of turquoise sea hemmed in by dry, dusty desert on either side, with a line of tankers queuing up to get across – most motorists cross the canal through a 1.6km subterranean tunnel, missing the canal completely. St Katherine’s monastery is well and truly on the backpacker trail. 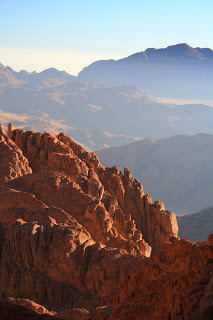 From sunny Dahab or five-star Sharm el Sheik, you can take a tour up to the mountain, leaving around 11pm, start climbing for 2-ish and hit sunrise on the peak for 5. Backpackers mingle with religious tourists from around the world, but the morning I climbed it, the antipodean accents were far outweighed by the phlegmy grumbles of Russians, Romanians and other unidentified former Eastern Bloc countries. I swear some were drinking vodka on the way up. If you’re doing the climb on a camel, it could be quite feasible that you drink your way to the top, tho the camel track peters out 750 steps shy of the peak. On the way up with my guide Ahmed and his police mate Hazim (I’m still not quite sure why he came, but he liked the walk), I counted six tea stops, where overpriced Mars bars and tea were doled out liberally by the local Bedouin population. You can even sleep in their toasty little huts for a few dollars and wake up to do a quick pre-dawn sprint to the peak. At the top, the nearest peak is St Katherine’s, the mountain where the saint’s remains were transported by angels after she was brutally murdered in her home town of Alexandria (think of the firework, Catherine’s Wheel). Her leathery caramel-brown skull and bejewelled left hand are still on display in the monastery, closely guarded by one of the dark-eyed monks, who chants ceaselessly while he guards the relics. This morning, I would have put the number on the mountain peak for sunrise at about 600. There were people strumming guitars and singing sad, slow hymns. Others perched on ledges, rolled out of their sleeping bags seconds before the sun rose, and yet more just kept their noses clear of their dusty, camel-smelling blankets in a bid to counteract the freezing pre-dawn temperatures. 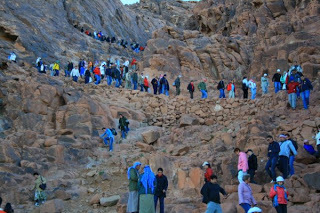 On the way down, the Bedouin guides skipped across the rocks, some carrying large video cameras, employed to get footage of the foreign pilgrims struggling down the hard way the 3000-odd steps cut into the rocks. Some hailed camels. In a fit of stupidity, I climbed the mountain for sunrise, then went back up again for sunset with mum and Lars, the Swedish icon expert we’d fallen in with. It was a funny trek up, mum on a lovely white camel called Abdul, led by the gentle Eid (please, ask for him if you ever climb this mountain, he loves his camels and he was so gentle with mum, it was a pleasure to do this trek with him). We made the sunset with seconds to spare – all 30 of us on the peak. As with sunrise, the crowd clapped appreciatively at the sun’s movements, this time as it was bleeding softly down over the blue mountains, but the climb down was in total darkness. So I accompanied mum and took a grey camel, Samba, led by 13-year-old Ibrihim, who assured me he was going to school tomorrow. We climbed down slowly, the camels’ great pads seeking the kindest route, Ibrahim calling out to Samba, while I clung to the wooden pommels, fore and aft and debated the likelihood of childbearing. Along the way, small Bedu villages and the highway, far below, were lit with orange lights. The monastery was almost in darkness, one light on its great walls, a beacon in the night to weary travellers and pilgrims such as we in need of bed, shower and a cold glass of …um… rosé. Life’s no bed of roses, but you’ve got to get it while you can, eh? People, I’m going to go all philosophical here. And I’m going to talk about religion. 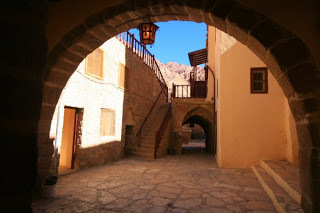 So rein in your dogmas… The reason why I’m broaching the most unpopular dinner party conversation is my recent visit to St Katherine’s monastery, high up in the mountains on the Sinai peninsula. The Sinai is one of those places in the world that links two continents and is therefore going to always be a flashpoint for conflict – think Constantinople, the American isthums… the Sinai desert separates foes Egypt and Israel, it’s where Moses and his folk wandered, lost, for 40 years (imagine that TV series, if you thought the current one would never end…), it’s rocky, barren and geographically inhospitable. 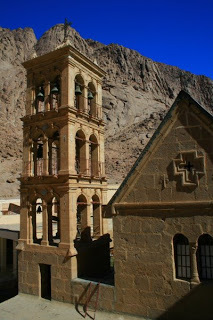 Perched high in the mountains is St Katherine’s Monastery, a Greek Orthodox fortress-church. Remember the Greeks were here back in the 3rd century, adding a Grecian gloss to the by now decaying Pharonic culture. Alexander popped in, liked what he saw, and when he passed on at the portentous age of 33, his general, Ptolemy, took over the reins for a new era in Egypt. 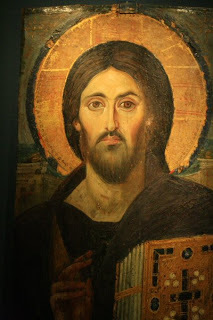 In the following centuries, becoming a hermit became deeply popular – many religions men and women took to living in caves or – spectacularly in the case of showman St Simeon, on top of a high stylus – to protest against changes in the Christian church. The remote monastery was built in the 6th century, and colonised by Greek monks. When Islam swept across the country a short decade afterwards, the prophet Mohommad wrote a letter of protection for the monastery and later, Napoleon granted the monastery a similar decree of protection in 1798 and even put some cash into repairing the walls. 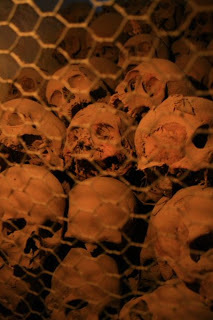 Throughout the centuries, the monks buried their bishops’ bones in a particularly creepy charnel house, and whiled away the hours peacefully painting those sad-eyed, gold tipped icons of Christ and the Madonna. One of these icons is St Katherine’s claim to fame – it’s the world’s oldest icon, and is displayed in the monastery museum, set up with the help of NY’s Metropolitan Museum of Art (MOMA). The tiny monastery also has the best religious library after the Vatican and is, by the way, most likely the oldest continually inhabited monastery in the world. The other and quite possibly bigger reason to visit the monastery (especially as the events are mentioned in the Ko’ran, Bible and the Torah) is the claim that the mountain behind the monastery is where Moses climbed to receive the 10 commandments. I have to say, having climbed it twice myself, he must have been a fit old bugger. And it’s also the spot where God appeared to Moses in a burning bush and told him to lead the Jews out of Egypt and into their own country – the land of milk and honey – following a pillar of cloud during the day and a pillar of fire by night. The burning bush is no longer burning, in fact a monk told me it has some very nice white flowers in the right season. However, I did read that accounts as early as the 13th century reported that “the bush had all been taken away by souvenir-seeking pilgrims”. Still, it’s a nice bush. And it’s the symbolism, right? In Egypt, a job is for life. So the young man who works the café near my apartment, who is fresh and full of fun, jokes and energy, will stay there until he ceases to work. Perhaps he’ll move to another café owned by the same man, but most likely he’ll stay. “There’s not a lot of chance for changing jobs in Egypt,” says my friend Mido. As we take tea in the café, another young, well-presented man hawks bags of Chinese goods to the café patrons – packets of screwdrivers, torches, and steel gadgets that have little meaning for me. He is followed by a shoe shiner, cigarette seller, a newspaper man. A teenage boy on a pushbike flies past, balancing on his head a mountain of fresh bread stacked in an open crate made from date palm spines, weaving in and out of traffic, while another man balances a large metal flask on his hip, pouring cool drinks into a cup for customers. Nearby, three young boys, brothers of about 7, 9 and 13 years, scrape a mountain of building sludge with pieces of cardboard from a petrol station driveway. A man sells six packets of tissues and five single cigarettes carefully laid out on a cardboard box in the street while the man beside him refills disposable lighters. 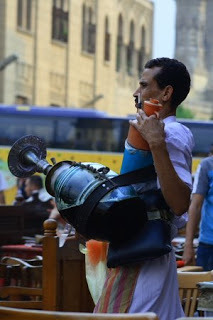 A man places a plastic whistle around his neck and directs traffic parking around a popular supermarket and every day, another man brings a chair and his bathroom scales to busy Talaat Harb street in the hope he can weigh a few patrons for less than a pound a pop. These are their jobs. Short of a trick to get the party going? Hassan el Hilali, Egyptian actor, singer and man who does weddings, parties, anything with a variety show of dwarves and strongman antics. I ran into him in a 24-hour cafe in Mohandiseen. Girls, he swears by Taft hairspray to keep his moustaches so fiercely erect. Far from wanting to beat up complete, non-Arabic speaking strangers wanting his photograph, he sent a clip of his upcoming song and a walk-on part in an Egyptian movie and is ready for a party any time. Ok, I have to give the credit for this headline to finance newsbreaker Pete. Thanks Pete. Dahab is indeed Rehab. The silence, the lapping water, the camels. The obession grows, people. Dahab is a night bus away from Cairo, which in itself is a fairly horrific experience as the bus loads at midnight, a video shrieks till 3am then the sun rises at 5ish over the mountain ranges of the Sinai. Brigid and I spent a day recouping (me from the bus trip, Brig from a hacking cough that is threatening to become bronchitis) and lolling about on said low lounges in the sunshine, then it was action stations the next day. I bounced limply out of bed for sunrise, and at 1pm my new friend Said and I were galloping up the mountains above Dahab, me on Sultana (think sultan’s wife, not dried fruit), a beautiful, headstrong grey who knows where to go and wants to get there double-quick time. Forget the idea that Egyptian animals are lame and riddled with sores, this is a tourist town and the animals’ owners know that we won’t ride maltreated beasts, but they truly do appear to adore their camels, horses and even sleek cats and dogs, who laze around on nearby cushions suggestively at meal times, seducing you into feeding them and then hanging around for a pat – unlike Cairo’s scared, mangy animals. 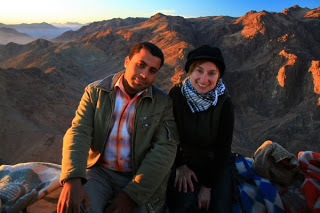 Because my inner thighs hadn’t had enough punishment on a galloping horse for 2.5 hours, Brig booked us in for a sunset camel trek – up different mountains, to watch the sun set the rocky hills on fire. So we entrusted our lives to two small boys who led the animals up to a collection of palm huts where we leapt off our bellyaching animals and walked up to the peak. The moon was full and creamy, the boys showed us their favourite games around the fire as we drank tea, then, when it was truly dark, we remounted our white camels and began the slow, peaceful trek back to the sea, to dinner under the stars and to plan our trip further into the Sinai. 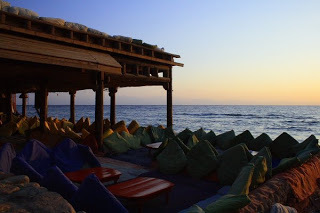 At sunset sitting at a cafe on the shores of the Red Sea, the water laps at the sea wall on which the cafe is built. We sit at long lounges of cushions and low tables, watching the sun set and the moon rises over the skyline of Saudi Arabia, across the narrow Gulf of Aqaba. Camels mosy on by, driven by young boys and an old Beduin man who lovingly adjusts his animal’s bridle. A young guy passes on a beautiful white horse, drumming up business for horseriding tomorrow morning. Restaurant touts arrange the fresh seafood catches on offer for tonight’s dinner. Dahab seems to cater for the diving backpacker, with the usual accoutrements for said clientele – tie-dyed floppy pants, leather wrist thongs, henna tattoos. 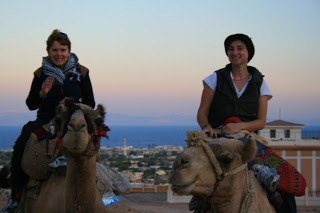 Despite or perhaps due to that, we offically love Dahab. Maybe not so much when it’s packed out, but in November, it’s well into low season and the vibe is laid back and sunny. It’s always sunny here. The Old Sphinx Hotel (hello Mido and Ramy!) isn’t called old for nothing; the bathrooms are tired and emotional, with little hot water and salt (yes, salt) water coming out of the taps. “It’s like a Flower Power place of the 70s,” said our new travel mate, Lars, a Swedish icon painter. “But with internet,” I corrected. If the hotel was any more laid back, it’d be horizontal. There’s old hippies, young hippies, chic nouveaus hippies with their laptops and eco principles, skimpies and maxi in their full Egyptian covering, divers and dreamers. Ther’s no rules but the rule is to chill. It’s a world from Cairo. Son of the sun, king of eternal time, said the stentorian voice in the darkness. Clouds of light chased across the night sky to grow stronger until they illuminated the buildings before us, the temples of Abu Simbel. Whoever designed Egypt’s Sound and Light shows is a total drama queen. 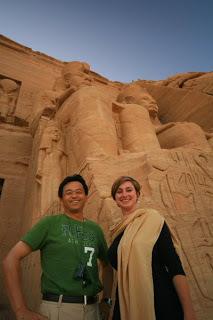 The last stop before on our cruise from Aswan to Abu Simbel, there are two temples, the great temple of Ramses II and the smaller temple dedicated to the goddess Hathor, built in a fit of uxority by Ramses for his beloved wife Nefertari. Ramses’ 20 meter high statues were buried by the desert until 1813, when a Swiss explorer stumbled upon them (they were later excavated by the Italian archaeologist, Belzoni, who consequently got all the glory). 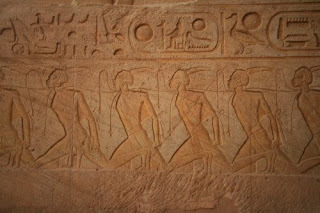 This is a rock-cut temple, carved into a mountainside, so when the temple was moved to higher ground as the Nile was flooded, engineers first built a buffer dam around the originals to protect the carvings from falling stone, then the massive statues were carefully cut into 830 blocks of stone. Only the faces remained uncut. 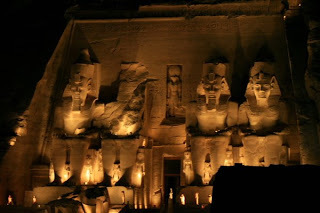 All throughout Aswan and Abu Simbel is the same 1960s video describing the rescue mission, which then cost USD$36 million, with nattily dressed paparazzi gathered to witness the cutting of the pharaoh’s face. You can’t see where the cuts were made, and if you were looking that hard, you’re just being picky. Our ship sailed slowly back and forth while we had an Egyptian buffet lunch (how do the mortals do it? ), then late in the afternoon, as the sun warmed the stone to a rich ochre, we climbed the stairs from our moored boat to the site. This far south, just 40km from the Sudanese border, it seemed hotter, the desert stonier and the water bluer. The interior of the temples was cool and slightly musty, but in many places the colours have been preserved – we always see the statues with the blank eye, but they were painted in, and look far more human for it. Well, as human as a man with a falcon’s head or a woman with cow’s ears can appear. Ramses had had carved a trilogy of scenes – going to war in his great chariot, lots of smiting (see earlier post) and treading on corpses, and returning home, his pet lion running alongside. In the depictions, he has long, lean limbs, broad shoulders, long eyes and is taller than any other man who walked the earth, as tall as the gods. Officially, you can’t take photos inside the temple but for an idea of scale, thousands of tourists are snapped beside Ramses’ statues at the front of the temple – little ants, we barely reach the top of his toes. I finally just found a shop that sells tonic. I forgive Cairo the black snot, the toilets like running sores and even the all-night industrial tailor whose workshop is above my bedroom. All for tonic water.